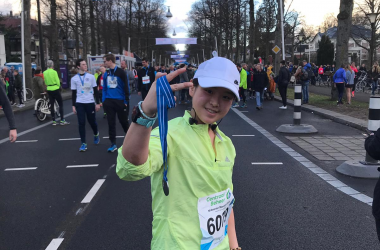 "All Wittenborg students and staff should take part in the next one"
A few brave students, staff and alumni faced the cold this weekend to fly the Wittenborg flag at the 2019 Apeldoorn Midwinter Marathon, participating in the 8-km race. It is the oldest running event still in existence in the Netherlands and in its 46th edition. About 15,000 people participated. Among them was Wittenborg’s Student Career Counsellor and Alumni Office Manager, Sanne de Jong, lecturer Gerjan Lammers, Chinese student Yudu Zeng and Indonesian MSc graduate, Janice Callista, who also took part last year. It is the 3rd time De Jong took part in the race, also running her best time and completing the race in 51 minutes. 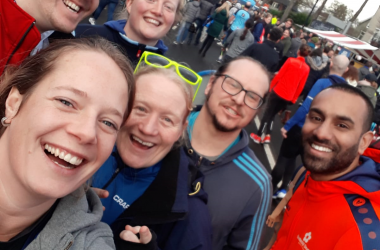 “It was a fantastic day to run – the sun was out and there was a great buzz. Despite the cold, it was not slippery."